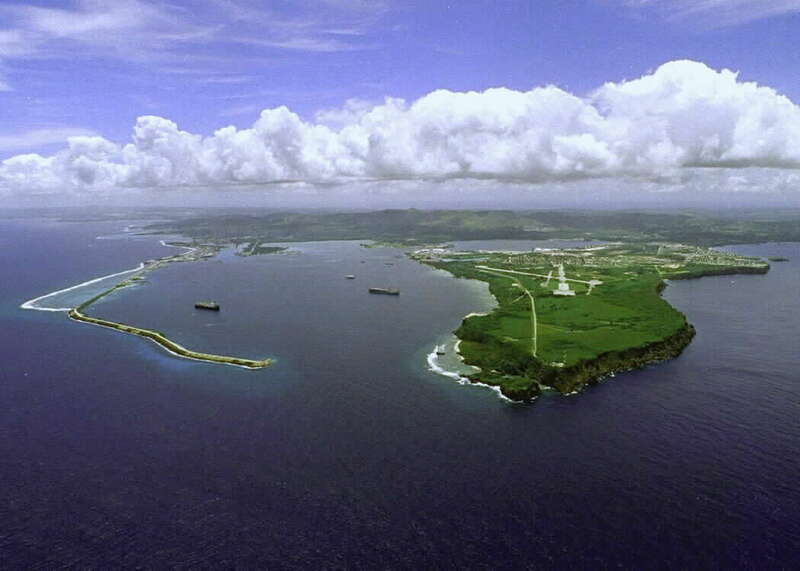 Hagatna, Guam's capital, is located approximately 3km from Apra Harbor. Apra Harbor is a tourist destination in itself, it has many historic buildings dating from the Spanish rule. Shuttles are often provided to Tumon, a little further away. This is where most hotels and (tax-free) shopping malls are located. One of the biggest Guam tourist attractions in Apra Harbor is the Asan Overlook. The Asan Overlook is home to a World War II memorial site. The names of the men and women who endured the war during the Japanese occupation have been carved into the walls. From the Asan Overlook, visitors will also have an incredible view of Apra Harbor Guam and the battle area where US Marines first stormed the beach to liberate Guam on July 21st, 1944. Liberation Day is still one of the major national holidays in Guam and is celebrated each July, with the bulk of the celebration taking place in Hagatna. Just 30 miles long and less than 9 miles wide, Guam is the largest of Micronesia's islands. Guam is also America's gateway to the West Pacific and Asia, and is a booming international resort destination. Guam's dramatic coastline and white sand beaches are ringed by coral reefs and clear, crystalline waters teeming with exotic marine life and blessed by a balmy tropical climate and gentle trade winds. Guam's natural beauty, the luxurious high-rise hotel and resort complexes that dominate the beach front at Tumon and Agana, the surrounding restaurants, malls, golf courses, water sports and entertainment facilities combine to create a perfect playground for visitors. Two Lovers' Point, also known as Puntan Dos Amantes and forming the northern tip of Tumon Bay, is a must see attraction when visiting the island of Guam. Legend holds that a pair of star-crossed lovers whose parents would not allow them to marry tied their hair together and jumped to their deaths from this 378-foot cliff. Visitors have a splendid view from this point of the gleaming white-sand beaches and lush hillside along the Philippine Sea and in central Guam. Admission fee to get to the look out tower of Two Lovers' Point is $3.00 per person. Many of Guam's most elegant hotels are situated on the strip of white sand bordering the sparkling aqua waters of Tumon Bay. Guam's favorite playground is bordered at both ends by towering green cliffs. There are a number of public parks and beaches to explore along Tumon Bay, as well numerous shops for you to go shopping. In most areas, the reef in Tumon Bay stretches out almost over a mile out into sea so the bay is sheltered from the ocean offering fun water activities. I Sengsong Chamorro Village Located next to the Hagatna Boat Basin and Paseo Stadium, the Chamorro Village offers visitors a glimpse into the island's culture, lifestyle and cuisine. This little shopping "village" features a variety of local foods and handicrafts. Vendors sell everything from clothing to handicrafts, bananas to betel nuts. And the aroma of freshly cooked local foods emanates from small booths where cooks stir steaming pots of seafood, fried chicken, pancit, barbecued ribs, and other delicacies. Guam has a limited bus system that can take you around the island. However, many tourists opt to take taxis, which are pricey but prevalent. Roads offer little if no shoulder in most places, making travel by bicycle unsafe. Those who do travel by bicycle are usually not in favor with the general road traffic on Guam. Guam rental cars are truly the only option for tourists. Even pedestrians on foot will often be seen carrying a stick to beat back any number of wild dogs that make up an unusually high population on the island. Guam rental cars provide not only transportation, but safety when unfamiliar with the area. Apra Harbor is also a popular Guam tourist attraction due to the high volume of activity happening there. Guam scuba diving and fishing trips leave often from the harbor shores. If you do plan to book a diving or fishing trip leaving from Apra Harbor, you will need to book your trip in advance. The actual offices for booking the trips are not located on the harbor, as most of the harbor is used for commercial or military purposes. Fishing trips are particularly popular from Apra Harbor as they head to the Mariana Trench, one of the most famous places in the world for fishing and catching blue marlin. Guam's duty-free shopping status means that no tariffs are added to many quality name brand international products. Lower prices on such items as watches, perfumes, leather goods, spirits, and other luxury products can be found. Shopping Centers The Micronesia Mall in Dededo, the Guam Premier Outlets in Tamuning, K-Mart in Upper Tumon, and the Agana Shopping Center are Guam's largest retail outlets. Each of these facilities offer everything for individual, home and office use, plus luxury and gift items. Several restaurants located at each shopping center are gathering spots for local business people as well as weary shoppers. The trolleys run to the main malls for $3 per trip or $10 day pass. The US dollar (USD) is the official currency. The national and local holidays observed on Guam are New Years, Martin Luther King Jr.'s Birthday, President's Day, Guam Discovery, Good Friday, Memorial Day, U.S. Independence Day, Guam Liberation Day, Labor Day, Columbus Day, Veteran's Day, Thanksgiving Day, Feast of Immaculate Concepcion, and Christmas Day.